1 Serron: Be careful about applying logic to prove this can't possibly be Paris. Remember what happened last time. 2 Serron: She turned out to be a slavering xenomorph intent on killing us all. 3 Spanners: So... you're saying it's better if we don't find that out? 3 Serron: No... then she won't be! Werner Heisenberg was, in 1927, one of the devisers of the Copenhagen interpretation of the strange behaviour implied by the newly described field of quantum mechanics. The interpretative difficulty comes about because of the indisputably effective wavefunction theory of Erwin Schrödinger, which describes the state of fundamental particles in terms of probabilities, rather than certainties. This is a stunningly successful theory and forms the foundation of much of modern physics. The problem is that it is extremely counterintuitive, and makes no sense at all if you imagine things like electrons and photons as being solid particles, like marbles, or if you imagine them as being waves, like ripples on a pond. Each of these things has properties of both particles and waves. This is possibly best illustrated by a classic experiment known as the double-slit experiment. If we think of waves of water spreading out from two sources, we can see that the circular ripples overlap in such a way that you get cancelling out of the ripples in some places, and reinforcing in other places. Where the ripples cancel out fall along lines radiating from the centre of the two sources, and likewise where they reinforce. You can see this in the image here, which was drawn by Thomas Young around 1800. The points labelled C, D, E, F are along the lines where the waves cancel out. If you imagine a wall along the right edge of the diagram, at points C, D, E, F the water level would stay steady, while at the points in between it would slosh up and down. It's pretty easy to show this with a tray of water, and many school science labs in fact show kids just such an experiment. The pattern of alternating regions of calm and sloshing is called an interference pattern. It gets more interesting if we think about light waves rather than water waves. Being a wave, light is also made of crests and troughs, which should cancel out or reinforce one another if they overlap in the same sort of configuration as the water ripples. What would this mean if you shine a light through a couple of narrow slits in an opaque screen? The light would spread out in "ripples" from each of the slits, and form an interference pattern on a screen on the other side of the room. You would end up with alternating regions of "calm" where the light waves cancel out, and "sloshing" where they reinforce. The effect of cancelling light waves is darkness, and the reinforcing is a bright area. So you should - if light behaves like waves - see alternating bands of dark and light on the screen. In fact, if you do the experiment, you do see exactly that. Again, this is a common experiment which can easily be carried out in school science labs these days, with the use of a laser. The result is illustrated by the second diagram (based on this diagram, released under the GNU Free Documentation Licence, version 1.2). So we've confirmed that light is a wave. But there are other effects of light which imply very strongly that light is a stream of particles. The best known is the photoelectric effect (incidentally, what Albert Einstein won the Nobel Prize for, not his work on relativity). The effect can be described quite simply: When light hits a metallic surface, it can kick electrons out of atoms in the metal. This generates loose electrons, which can be used to do stuff like generate electricity. Einstein's contribution was to show that the electrons kicked out had to have absorbed a certain threshold amount of energy in order to be released, and that this was related to the frequency of the light, not its intensity. This led to the idea of light being a stream of particles of a given energy related to their frequency. It was essentially impossible to explain the photoelectric effect any other way - in particular, if light was a wave it wouldn't work that way. You can go further. If you decrease the intensity of the light, making it very dim, you can still kick electrons out. But they get kicked out less frequently. You can eventually reach a stage where the light intensity is so low, that you're only ejecting an electron once every few seconds. There is no sensible way to explain this using waves - the light has to be composed of particles that you are throwing at the metal in separate chunks, like cricket balls. Each cricket ball of light knocks out an electron. We call these cricket balls of light photons. Here's where things get really interesting. 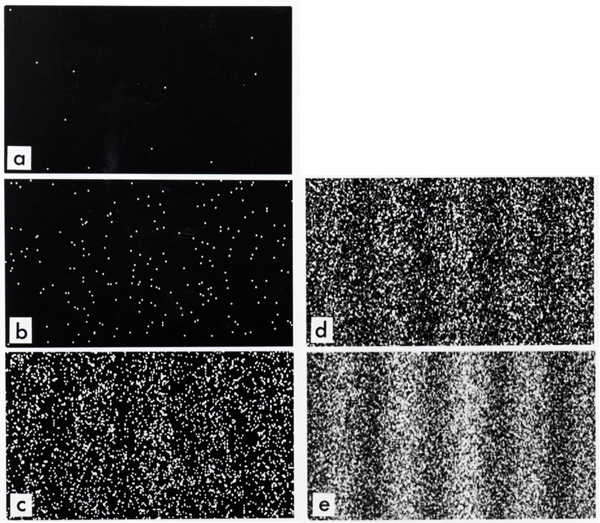 What if you try to do the double slit experiment, with light so dim that it is composed of one particle of light - one photon - every few seconds? 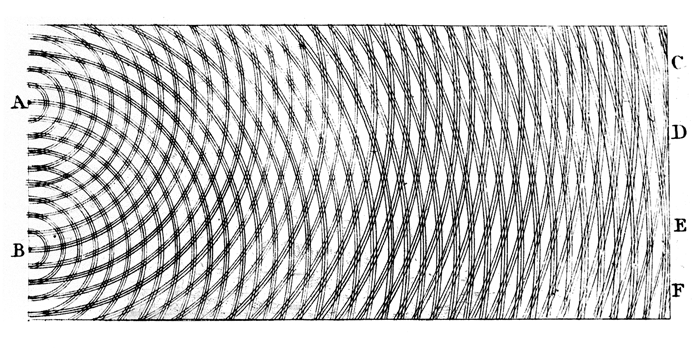 The astonishing answer is that you still get the wave interference pattern. How? You can see how in the third diagram, which is the result of an actual experiment. (Figure originally from Wikimedia Commons, released under the GNU Free Documentation Licence, version 1.2.) In panel a, we've fired only a few photons through the slits. You can see them detected by the electrons they kick out of a photodetector (similar to the detector in a digital camera) by the photoelectric effect. So there's no doubt they are individual particles of light, not waves. With just a few of them, they look scattered about randomly, with no rhyme or reason. But over time - and this takes time, since we are only letting through a few photons every few seconds - the detected photons build up. Slowly, but surely, a pattern emerges. By panel e, we can see clearly the double slit interference pattern emerging, with bands of alternating light and dark, picked out by clumps of photons. This is not a difficult experiment to do. I've done it myself in my university undergraduate physics labs. It's within reach of school science labs, and I wouldn't be surprised if some schools actually did it. Now think about what it actually means. You're throwing individual cricket balls of light at a couple of slits in a screen. They arrive one at a time, with a noticeable gap in between each one. There is no conceivable way that one of these photons of light could pass through both slits and cause an interference pattern with itself. Is there? Yet after throwing several hundred photons at the slits, there it is, on your photodetector (which itself also confirms that the light is made of particles, remember) - an interference pattern that confirms that light must be a wave. How are we to understand this? Given classical physics, which essentially means physics before 1900, there is simply no way to explain this at all. This experiment single-handedly provides the proof that we had to come up with a new description of physics to explain what happens on a subatomic level. Schrödinger and Heisenberg and others, in the early years of the 20th century, provided the new mathematical framework that could explain how light (and electrons, and pretty much everything, really) could behave like some sort of strange hybrid of waves and particles. So how does the new mathematics explain it? The answer lies in the concept of abandoning the idea that you can predict exactly where an object will go, based on how it is moving now. This is a strange thing to do, especially for a science that purports to explain how the universe behaves. After all, if we throw a cricket ball at a certain angle and speed, we can calculate, using classical physics, exactly where it will hit the ground - and that's where it will hit the ground. (If there's some wind, we can take that into account too - the point is we can take everything into account and always calculate the result.) No surprises, no uncertainty. If you are not moving and you drop an object it will land directly below where you dropped it, not on the other side of the room. Not so with subatomic particles. If you throw a photon at a couple of slits, that photon might end up in a number of different places. It will not end up in the same place each time. You can see this by looking at that third diagram again. In panel a, a dozen or so photons have been fired at the double slits. Each photon might well have travelled exactly the same path until it hit the slits. But after passing through the slits, look at the result. They are scattered all over the place, seemingly at random. In fact, where they end up is random. We have no way of predicting where any given photon will land. None whatsoever. We simply don't know. Physics doesn't tell us. But all is not lost, not by a long way. Schrödinger's wave equation can tell us where the photons are likely to end up. It turns out, if you do the mathematics, that the probability of any individual photon ending up in a dark part of the interference pattern is low, while the probability of any individual photon appearing in a bright part of the pattern is high. For a few photons, these probabilities look pretty random, but over time you start to see the pattern emerging. It's like rolling a die. If you roll a die only 10 times, you are likely to end up with a bunch of numbers that includes three 4s and no 6s or something like that. But if you roll it 1000 times, the numbers of 4s and 6s will start to be much closer to one-sixth of the number of rolls. You need a large number of photons to see the pattern - but it is "there" in the probabilities all along. Quantum mechanics is certainly imposing. But an inner voice tells me that it is not yet the real thing. The theory says a lot, but does not really bring us any closer to the secret of the "old one". I, at any rate, am convinced that He does not throw dice. While Einstein was impressed with the predictive power of quantum mechanics, he was initially sceptical of the probabilistic arguments necessary to make it work. As Einstein so pithily pointed out, it raises philosophical questions on how the universe works. Can it really be random on the most fundamental level? Heisenberg's Copenhagen interpretation of quantum mechanics was an attempt to reconcile the seemingly paradoxical assumptions of quantum mechanics with its inarguably correct results. The idea is that a particle of light behaves as a wave as it passes through the double slits, and emerges as a probability wave function on the other side, not as a particle as such. This wave function then propagates through space, like a wave, producing an interference pattern of peaks and troughs, until it is "observed" in some way - say by hitting a surface and ejecting an electron. When the probability wave is observed in this way, it immediately "collapses" into a particle at a given location - the location being randomly determined from the probabilities in the wave. 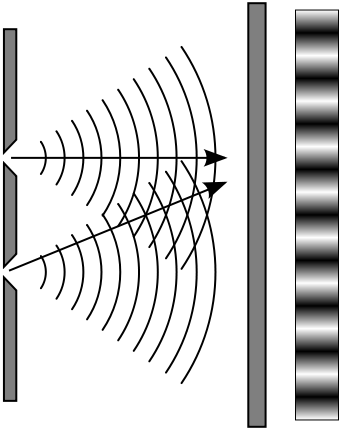 So in this picture, each photon propagates beyond the slits as a wave of probability, and only when it reaches the screen and kicks an electron out does it collapse into a particle at a given location again. On a subatomic level, this kind of makes sense, and it certainly works as an explanation. But it sounds weird, and not at all how objects behave on a macroscopic level. This is the source of the thought experiment known as Schrödinger's cat, in which some sort of subatomic process produces an event which has a 50% probability of ending up in one state and a 50% probability of ending up in another. (It's usually done with radioactive decay, which also obeys quantum laws, but you could restructure it with photons and double slits if you wanted.) You stick this thing in a box with a cat. If the event goes one way, you have a device that poisons or otherwise kills the cat; if it goes the other way, you let the cat live. Now the thing is that the Copenhagen interpretation says that the quantum event ends up in a probability state, with a 50% chance of being in one actual state or the other - and (here's the important bit) that it's not actually in either state until someone observes it. That is, the probability wave function remains a probability wave function, and does not collapse into one state or the other, until somebody opens the box and looks at it. But... the state of the event controls the fate of the cat. If the event is in indeterminate probability wave function with a 50% chance of being either way, then so must be the cat. The cat is, according the the Copenhagen interpretation of quantum mechanics, neither alive nor dead until you open the box to check how it's going. This sounds clearly ludicrous. Schrödinger used the argument of his cat to try to demonstrate that the Copenhagen interpretation of his equations was just silly, and therefore wrong. Einstein was evidently on his side too. The problem is, the Copenhagen interpretation actually works. Science is strange sometimes. Interestingly, when I wrote this comic, I was unsure whether to use Schrödinger or Heisenberg in the punchline. I wrote it down as Schrödinger. Then when I came to assemble it, I thought about it, and changed it to Heisenberg. Now, after writing this entire annotation, I've just decided I was right the first time, and edited the comic to change it back to Schrödinger. That's why the very first line of this annotation mentions Heisenberg, and not Schrödinger. 2019-03-16 Rerun commentary: Of course, in a parallel universe, I did use Heisenberg in the punchline of the comic instead of Schrödinger. Whether more people laughed at it in that universe than in this one is left as an exercise for the reader.